Although the sludge treatment and disposal is one of the priority issues but it is expected that its production will increase due to the intensification of current environmental legislation. For example, organic sludge discharging into the ocean occurred from 77% in 2005 to 47% in 2009 and then to 14% in 2013. The cost of sludge treatment included 50%–60% of all wastewater treatment costs. Therefore, due to rise of these costs, it is essential to optimize mechanical equipment that are condensed on thickening and dewatering of sludges. Sludge thickening by different methods such as gravity settling, filter presses, belt filter press, vacuum filters, centrifuges, chemical processes, and dissolved air flotation (DAF) had been done. DAF is a conventional wastewater treatment process since the 1950s. Application of this process in large plants is economical. Several studies have reported that the effluent of DAF process does not include any solid materials. Flotation is a physicochemical process that had advantages such as high speed, low space requirements, flexibility, and low costs. Although the flotation had different types, the application of DAF in water and wastewater treatment had been growing in the last three decades. DAF process had been used primarily for the removal of suspended and colloidal solids, such as fine particles, by lowering their density. This process can widely be used associated with water treatment and purification of municipal and industrial wastewater. Coagulation and flocculation are the essential processes for the removal of colloidal particles in water and wastewater treatment. Many coagulants can be applied in DAF systems, including alum, poly aluminum chloride, aluminum chloride, poly aluminum sulfate, ferric chloride, bentonite, and organic polymers. Many studies were investigated the effect of coagulation on DAF efficiency.,,, A study reported that DAF process with magnesium coagulation had high efficiency to removal of Chlorella zofingiensis microalgae. Aluminum salts and iron salts are the conventional used coagulants. Due to public health concerns about residual alum ions, ferric chloride was selected in this study. In the DAF process, compressed air was injected into the wastewater tank. As a result, composed air bubbles attached the fine particles inside the tank and made them float on the water surface. Amirkabir industrial town is located at the southeast of Kashan in Iran. This industrial town is composed of several units that most of them produce chemicals and foods. Amirkabir industrial town wastewater treatment plant (AITWTP) simultaneously treats the sanitary and processed wastewater and had 1112 square meters foundation, an area of 1.5 hectares, and a daily treatment capacity of 350 cubic meters. Few studies have been conducted on sludge thickening with DAF method. Considering the high volume of sludge generation and its related problems, such as treatment, transport, and environmental risks, we had tried to examine the effect of DAF process with and without coagulants addition on biological sludge thickening in our study. This experimental study was carried out on a batch laboratory scale on DAF process for thickening of biological sludge which withdrawn from the AITWTP in Kashan, Iran. All analyses were carried out according to the standard method in Research laboratory of Public Health School, Kashan University of Medical Sciences. The system consists of a flotation tank, pressure tank, and air compressor. Flotation tank had dimensions of 10 cm × 10 cm × 35 cm which filled by 3 L water (freeboard = 5 cm). At a distance of 3 cm from the bottom of the tank, a sampling valve was embedded. In addition, the pressure tank had a height of 45 cm and diameter of 35 cm with 173 L capacity. The DAF system is operated based on a batch reactor including coagulation, flocculation, and flotation steps in the flotation vessel, respectively. To determine the dosage and optimum pH, jar test was used, such a way that first, ferric chloride (Merck Company) was added as coagulant in different doses to determine the best coagulant dose effect on DAF efficiency by turbidity measurement from supernatant samples. Then, this test was done again in various pH ranges. Finally, maximum efficiency was obtained in specific pH and coagulant dose as optimum. Where Sa is air solubility (18.7 ml/l at 20°C), R is recycling rate (%), ƒ is fraction of air dissolved at pressure P (usually 0.5), P is pressure (atm), and Su is suspended solids (mg/l). According to equation 2, recycling flow rate can be defined by divided of saturated water volume (r) to raw wastewater volume (v). Equation 1 was used to calculate the recycling flow rate; in this manner, all parameters except pressure and recycling rate have been defined. The recycling flow rate depends on pressure. Hence, based on the pressure of 3, 5, and 7 atm, the recycling flow ratio was calculated 400%, 135%, and 87%, respectively. The theoretical size of the produced bubbles was determined in the range of about 40–140 μm according to specified pressures. Sludge sample was taken from the return activated sludge line in AITWTP, transferred to laboratory, and stored in refrigerator at 4°C. Sludge analysis including pH, TSs, TSSs, turbidity, and total dissolved solids (TDSs) was performed at room temperature according to the American Public Health Association (2540 B). To determine the effect of DAF on sludge thickening, first, a certain volume of water was dumped into the pressurized tank under three pressures (3, 5, and 7 atm) for 30 min. At the same time, a certain amount of sludge sample according to the calculated recycling rates was dumped into the flotation vessel. Then, coagulation (1 min detention time and 180 rpm) and flocculation process (30 min detention time and 30 rpm) were applied. Next, the flow of saturated water with an average of 0.317 m3/h (SOR = 31.7 m3/m2/h) discharged into the flotation vessel, up to 3 L. Finally, after flotation process (2-pdf), samples were taken at interval of 5 and 10 min from the subnatant and analyzed for TS, turbidity, and TDS parameters comparing with control samples to assess the efficiency of DAF process. The times of 5 and 10 min and pressures of 3 and 5 atm were selected according to prior studies; however, pressure of 7 atm was selected as a novelty and has not been seen in previous studies. Finally, according to sampling method, reduction of three parameters in subnatant was assumed as increasing in process efficiency. All experiments were repeated three times and the average values were used for statistical analysis. First, Kolmogorov–Smirnov test was used for checking the data normality. Then, ANOVA test was used to analyze the results (P < 0.05). All the analyses were applicated with SPSS Version 16.0. (Chicago, SPSS Inc). To determine the optimal dose and pH, jar test was used. The results of this test showed that coagulation and flocculation process in pH = 7.5 and coagulant dose of 200 mg/l had the highest efficiency. The results of this study are summarized in [Table 1]. Results of DAF process efficiency during detention time are shown in [Figure 1]. 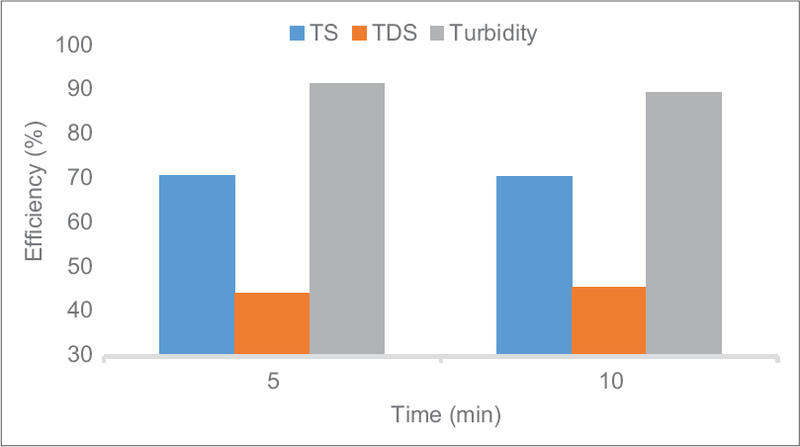 Based on data in [Figure 1], it is obvious that DAF efficiency for TS in 5 and 10 min is 70.76% and 70.62%; for TDS it is 44.38% and 45.5%; and also for turbidity it is 91.64% and 89.66%, respectively. The effects of pressure on DAF removal efficiency for sludge thickening are shown in [Figure 2]. As shown in [Figure 2], the average removal rate at 3, 5, and 7 atm was 77.6%, 76.33%, and 58.12% for TS; 56.85%, 47.15%, and 30.8% for TDS; 92.59%, 96.59%, and 82.76% for turbidity, respectively. In our study, effect coagulant addition on DAF efficiency was determined. As shown in [Figure 3], with coagulant addition, DAF has efficiency of 73.45%, 45.01%, and 93.94% for TS, TDS, and turbidity, respectively. Furthermore, without coagulant addition, these efficiencies were obtained 67.93%, 44.87%, and 87.37%, respectively. The present study aimed to determine the effect of DAF process on waste activated sludge thickening of wastewater treatment plant of Kashan's Amirkabir industrial town. Maximum removal of TS was obtained under conditions of coagulant addition, 5 min of detention time, and pressure of 3 atm that was equal to 84.02%. Maximum TDS removal was determined 61.01% at coagulant addition, 5 min of detention time, and pressure of 3 atm. Furthermore, the best removal for turbidity was achieved 97.89% without coagulant addition, 10 min, and 5 atm. 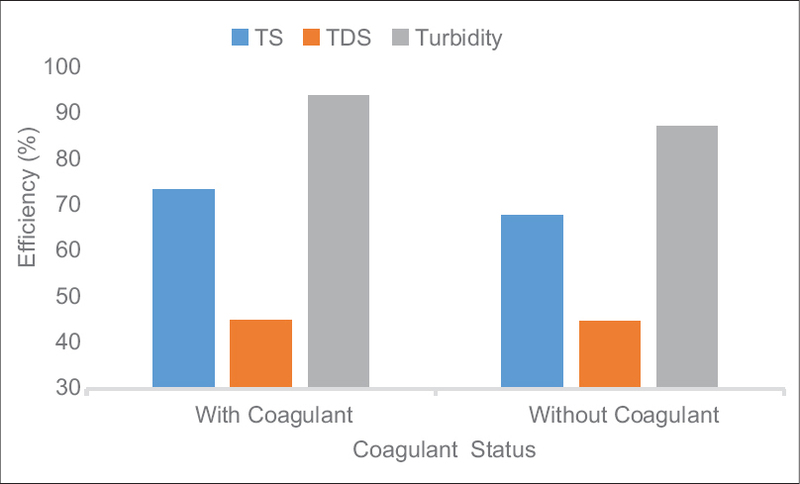 As shown in [Figure 1], efficiency removal of TS, TDS, and turbidity parameters, with and without coagulant addition, has little changes, and they have insignificant relationship over the time (P > 0.05) that is not consistent with the findings of other studies.,,, Typically, in these studies, increasing of efficiency was seen. The reason of this stability can be attributed to the detention time of less than 5 min. In addition, heavy flocs formation can be one of the effective factors on decreasing of DAF flotation ability over the time. 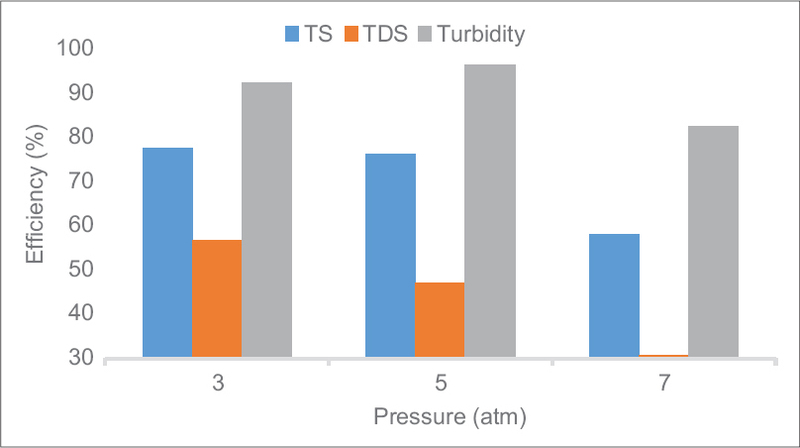 According to [Figure 2], TS and TDS removal efficiency under conditions of various pressures and with/without coagulant addition significantly decreased (P < 0.05); however, pressure of 5 atm has maximum removal of turbidity, significantly. According to equation 1, the solubility of air in liquid increases with increasing pressure theoretically. In a study, with increasing of pressure from 0.1 Mpa to 0.5 Mpa, TS content of domestic wastewater reduced from 25 mgL−1 to 12 mgL−1. In addition, in the previous study which we done for thickening of hospital wastewater treatment plant sludge, increasing of pressure from 5 to 7 atm, caused to removal improvement of turbidity and EC, however, TS had little changes. This direct relationship between pressure and removal efficiency is also observed in several other studies., Considering the low application of DAF in studies related to sludge thickening, the reason of this inverse relationship can be attributed to the high concentration of TS in sludge and thus limitation of A/S ratio resulting from that concentration. Except for the TDS parameter, coagulant addition caused to insignificant increasing of TS (P > 0.05) and significant increase of turbidity removal efficiency (P < 0.05). The stability of TDS can be due to the presence of coagulant salt in sludge. However, effect of coagulant absence in comparing with coagulant addition is appropriate. The results of one study showed that without using of chemical pretreatment, the removal of suspended solids and oil and grease increased 57% and 60%, respectively. In our study, cause of this phenomenon can be attributed to extracellular polymeric materials which have accounted 60%–80% of sludge. Many investigations have proved importance of these materials on the flocculation, settling, and dewatering characteristics of the sludge. In a study, coagulant addition leads to an increase in suspended solids removal from 82% to 99% that is consistent with our study results. In general, it can be concluded that the efficiency of the process with the coagulant is higher than without coagulant addition. According to our study findings, it can be concluded that DAF process is efficient for TS and turbidity removal for the industrial wastewater sludge thickening, but more study is necessary for final decision in this regard. In addition, maximum efficiency was obtained in the pressure of 5 atm, time of 5 min, and addition of coagulant. Therefore, considering the limitations of A/S, in future studies, it can be recommendable to the use of less concentrated sludge in the DAF process for the thickening. Furthermore, pressure of 7 atm not only economically but also in terms of efficiency has not been efficient and high-pressure levels application are not recommended. According to low difference in the efficiency of the process in the presence and absence of coagulant, it is suggested not to use coagulant for decreasing of operating costs. We would like to thank the Department of Environmental Health and Deputy of Research and Technology of Kashan University of Medical Sciences for financial support. This investigation was under supervision and support of Kashan University of Medical Sciences. Chae JS, Choi SA, Kim YH, Oh SC, Ryu CK, Ohm TI. Experimental study of fry-drying and melting system for industrial wastewater sludge. J Hazard Mater 2016;313:78-84. Balasubramanian S, Tyagi RD. 2-value-added bio-products from sewage sludge. Current Developments in Biotechnology and Bioengineering. Amsterdam, Netherlands: Elsevier; 2017. p. 27-42. Silva TL, Ronix A, Pezoti O, Souza LS, Leandro PK, Bedin KC, et al. Mesoporous activated carbon from industrial laundry sewage sludge: Adsorption studies of reactive dye Remazol Brilliant Blue R. Chem Eng J 2016;303:467-76. Huang H, Yuan X, Zeng G, Zhu H, Li H, Liu Z, et al. Quantitative evaluation of heavy metals' pollution hazards in liquefaction residues of sewage sludge. Bioresour Technol 2011;102:10346-51. Hoseindoost G, Miranzadeh MB, Ahmadi M, Hallajian V, Borj HR, Siaf H. A survey on nutrient removal in a combined wastewater treatment system in Kashan University of Medical Science, Iran. Ecol Environ Conserv 2014;20:1471-7. Miranzadeh MB, Tehrani AM, Tavakoli Z, Gilasi H. Comparing the efficiency of fenton and ozonation with fento-ozonation process in excess sludge reduction. J Mazandaran Univ Med Sci 2016;25:166-76. Mostafaii G, Miranzadeh MB, Khodadadi R, Mosavi GA, Iranshahi L. The correlation between suspended solid concentration and microbial quality of Wastewater Treatment Plant (WTP) effluent. Ecol Environ Conserv 2014;20:681-4. Turovskiy IS, Mathai P. Wastewater Sludge Processing. Hoboken, New Jersey: John Wiley and Sons; 2006. Rahmani AR, Nematollahi D, Godini K, Azarian G. Continuous thickening of activated sludge by electro-flotation. Sep Purif Technol 2013;107:166-71. Rabbani D, Miranzadeh M, Motlagh AA. Study for determination of industrial water corrosivity in Kashan Fajre Sepahan Galvanizing Mills during 2005-2006 Iran. Pakistan journal of biological sciences: PJBS. 2008;11:131-4. Tsai JC, Kumar M, Chen SY, Lin JG. Nano-bubble flotation technology with coagulation process for the cost-effective treatment of chemical mechanical polishing wastewater. Sep Purif Technol 2007;58:61-7. Wang H, Chen XL, Bai Y, Guo C, Zhang L. Application of dissolved air flotation on separation of waste plastics ABS and PS. Waste Manag 2012;32:1297-305. Liang Z, Wang Y, Zhou Y, Liu H. Coagulation removal of melanoidins from biologically treated molasses wastewater using ferric chloride. Chem Eng J 2009;152:88-94. Miranda R, Nicu R, Latour I, Lupei M, Bobu E, Blanco A. Efficiency of chitosans for the treatment of papermaking process water by dissolved air flotation. Chem Eng J 2013;231:304-13. Kim Y, Choi D, Cui M, Lee J, Kim B, Park K, et al. Dissolved air flotation separation for pretreatment of membrane bioreactor in domestic wastewater treatment. J Water Supply Res Technol Aquat 2015;64:186-93. Quartaroli L, Kuritza JC, Cavallini GS, Vidal CD, de Souza JB. Application of cationic and anionic polymers in dissolved air flotation as a means of post-treatment of pulp and paper industry wastewater. Sci Forestalis 2014;42:57-67. Lee EJ, Kim HS, Jang A. Application of dissolved air flotation (DAF) with coagulation process for treatment of phosphorus within permeate of membrane bioreactor (MBR). Desalination Water Treat 2016;57:9043-50. Esmaeili A, Hejazi E, Hassani AH. Removal of chromium by coagulation-dissolved air flotation system using ferric chloride and poly aluminum chloride (PAC) as coagulants. Water Air Soil Pollut 2014;225:2140. Zhang X, Wang L, Sommerfeld M, Hu Q. Harvesting microalgal biomass using magnesium coagulation-dissolved air flotation. Biomass Bioenergy 2016;93:43-9. Creamer KS, Chen Y, Williams CM, Cheng JJ. Stable thermophilic anaerobic digestion of dissolved air flotation (DAF) sludge by co-digestion with swine manure. Bioresour Technol 2010;101:3020-4. Clesceri LS, Eaton AD, Greenberg AE, American Public Health Association, American Water Works Association, Federation WE. Standard Methods for the Examination of Water and Wastewater. Washington, DC: American Public Health Association; 1998. El-Gohary F, Tawfik A, Mahmoud U. Comparative study between chemical coagulation/precipitation (C/P) versus coagulation/dissolved air flotation (C/DAF) for pre-treatment of personal care products (PCPs) wastewater. Desalination 2010;252:106-12. Burton F, Tchobanoglous G, Tsuchihashi R, Stensel HD, Metcalf, Eddy I. Wastewater Engineering: Treatment and Resource Recovery. New York: McGraw-Hill Education; 2013. Sourani M, Mehrabani A, Ghafari Gh, Hasheminejad H. Oil refinery wastewater treatment by coagulation with ferric chloride and dissolved air flotation. Farayandno 2014;9:27-35.
de Rijk SE, Jaap HJ. Aivan Der G, den Blanken JG. Bubble size in flotation thickening. Water Res 1994;28:465-73. Kurama H, Karagüzel C, Mergan T, Çelik M. Ammonium removal from aqueous solutions by dissolved air flotation in the presence of zeolite carrier. Desalination 2010;253:147-52. Hosseinzadeh H, Shayegan J, Jalali M. Performance enhancement of dissolved air flotation column in removing low concentrations of heavy fuel oil by adding powdered activated carbon. Desalination Water Treat 2013;51:3353-60. Zheng T, Wang Q, Shi Z, Huang P, Li J, Zhang J, et al. Separation of pollutants from oil-containing restaurant wastewater by novel microbubble air flotation and traditional dissolved air flotation. Sep Sci Technol 2015;50:2568-77. Zhang Q, Liu S, Yang C, Chen F, Lu S. Bioreactor consisting of pressurized aeration and dissolved air flotation for domestic wastewater treatment. Sep Purif Technol 2014;138:186-90. Atamaleki A, Mostafaii GR, Miranzadeh MB, Iranshahi L, Akbari H, Safari H. Effect of dissolved air flotation process on thickening of activated sludge. Int Arch Health Sci 2016;3:201-5.
de Nardi IR, Fuzi TP, Del Nery V. Performance evaluation and operating strategies of dissolved-air flotation system treating poultry slaughterhouse wastewater. Resour Conserv Recycl 2008;52:533-44. Zhang W, Chen Z, Cao B, Du Y, Wang C, Wang D, et al. Improvement of wastewater sludge dewatering performance using titanium salt coagulants (TSCs) in combination with magnetic nano-particles: Significance of titanium speciation. Water Res 2017;110:102-11.